A student fills in answer bubbles on a standardized test. Board of Regents Chancellor Betty Rosa has directed New York's Education Department to draft a proposal that would extend the moratorium decoupling student performance on standardized testing with teacher evaluations. 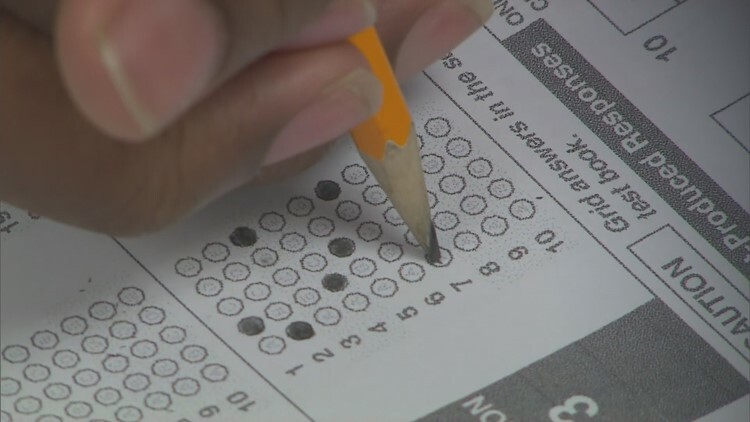 ALBANY - Board of Regents Chancellor Betty Rosa has directed New York's Education Department to draft a proposal that would extend the moratorium decoupling student performance on standardized testing with teacher evaluations. The proposal, if approved next month, would extend the moratorium for one year. It was originally set to expire at the end of the current school year. "What we want to do is be mindful, thoughtful and inclusive in making sure that the voices of our teachers, principles, superintendents, stakeholders, everyones voices are heard," Rosa said. The extension was praised by the New York State United Teachers union, a powerful entity with 600,000 members that has fought to end the controversial teacher evaluation practice. "We welcome the extension of the moratorium and thank Chancellor Betty Rosa and the Regents for continuing to recognize that the state’s over-emphasis on standardized testing has worked for neither students nor teachers," the union said in a statement. Years ago, Gov. Andrew Cuomo proposed tying teacher evaluations to students' performance on standardized tests, arguing at the time that it benefits students because it helps root out poor performing teachers. "Let's remember the children in this process and then we'll end up doing the right thing," Cuomo said at the time. But NYSUT and parents across the state argued the standardized tests put too much pressure on students and is therefore unfair to evaluate teachers based on their scores. And the state initially put in a three-year moratorium in 2015. Even still, the pushback against the Common Core educational standards led to a broad opt out of students taking the tests. Around 20 percent of eligible students were opted out of the exams by their parents in recent years as a way of pushing back against the practice. The decision Monday to extend the moratorium received criticism. High Achievement New York, a group that supports tougher standards, said the decision was "neither a surprise nor a solution." "What we need is for all parties to agree on an evaluation plan that contains an objective, statewide measurement of student growth," the group said in a statement. Efforts to restructure the state's teacher evaluation process have gained traction in Albany in recent months, but haven't been approved by the state Legislature. That could change in January, when Democrats take control of the state Senate, giving Democrats power over state government. Republicans have long held the majority in the Senate and blocked some reforms sought by the union. “It has become increasingly clear that standardized tests do not fully account for the diversity of our student populations,” Assembly Speaker Carl Heastie, D-Bronx, earlier this year.